MSV: Toxic "person of interest" identified in midnight flyers? Toxic "person of interest" identified in midnight flyers? MSV can exclusively report the Hoboken Police Department has obtained critical new evidence in the midnight flyer attack on Councilman Ravi Bhalla. The new evidence provides clarity in the ongoing investigation identifying new leads. Rumors of additional police interviews reportedly have taken place in recent days with more expected leading to a person of interest. Two midnight flyers appeared in the last Hoboken mayoral campaign with one coming days before the election last Tuesday attempting to link Councilman Ravi Bhalla to terrorism. The flyer backfired leading to an astounding turnout of over 15,000 Hobokenites going to the polls. Fully a third sympathetically voted to elect Bhalla Hoboken's first Sikh mayor in a six person field. An earlier midnight flyer against Mike DeFusco linked him to Old Guard politicos including the notorious Carmelo Garcia and former councilman Chris Campos who was convicted earlier this year of bank fraud. Another version of that midnight flyer appeared with the words "Crime Family." 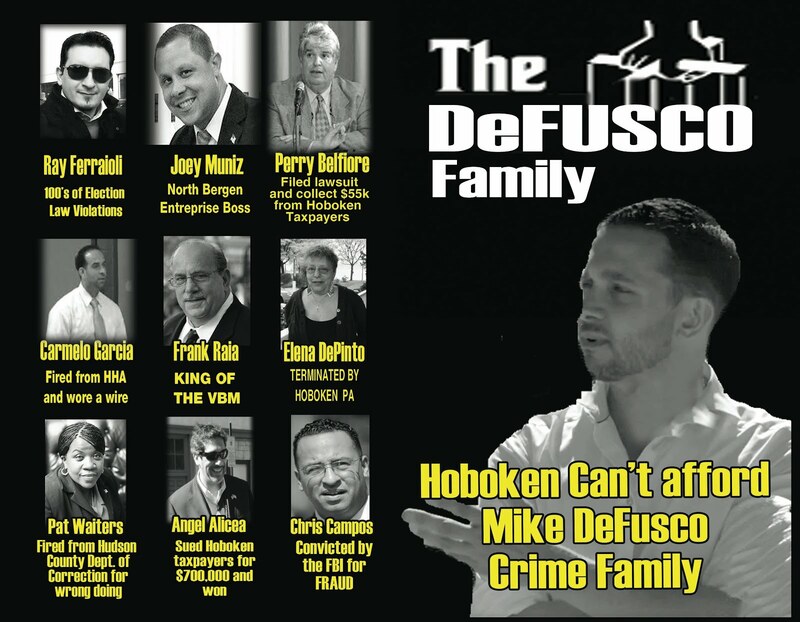 The DeFusco campaign is furious about the flyers. Councilman Mike DeFusco denounced both in the strongest terms a week ago last Saturday. His campaign believes the flyers were detrimental to his campaign efforts when he came in second last Tuesday. Additional frustration comes with reports of DeFusco's attempts to work with the Bhalla campaign to present a united front in the Hoboken community. His initial efforts to contact Ravi Bhalla on the terrorist flyer were reportedly ignored. Post election efforts to see a united front with a reward to identify who is behind the midnight flyer attacks were similarly rebuffed by the Bhalla camp. DeFusco's sister announced a GoFundMe over the weekend leading to conviction for the midnight flyer attacks against her brother and Ravi Bhalla seeing more than $6,400 pledged. Councilman Bhalla has instead been seen on a media blitz showing the midnight flyer directed against him on TV with DeFusco's name on it. The flyer is a hacked version of an earlier DeFusco campaign mailer further enflaming the first ward councilman. Some suggest the lettering added is similar to the hack on the DeFusco "Crime" Family midnight flyer. The weekend paper stated some people believe both flyers were created by the same parties. Al Sullivan wrote, "Some sources believe both flyers were designed by the same people... The second flyer aimed at Bhalla actually seems to have helped Bhalla by giving him a sympathy vote, which some believe it was intended to do." Over the weekend, Nancy Pincus claimed innocence with the midnight flyers. She also claimed she was innocent of "creating" the DeFusco Crime Family flyer. may be planning action against Nancy Pincus. Talking Ed Note: Nancy Pincus, the controversial and toxic avenger blogger at Sybil's Cave responded to an innocuous comment here fearful the DeFusco campaign is preparing action against her. MSV does not add important story information by way of the comments section. Story information appears independently or by way of an update. Last week, Nancy Pincus published an article alleging criminal activity by this editor in a Hoboken polling station. This is her second criminal allegation against MSV in recent weeks. An earlier story she published made an allegation of perjury. The Pincus allegation of voter poll criminality was completely crushed as MSV followed with a breaking story of a major election violation uncovered by this editor. Nancy Pincus is revealed conspiring with the Russo Clan publishing a false and defamatory hit job. Last week, MSV publicly requested a retraction. A comment late Friday about possible big news was not about Hoboken. The councilman has made his national partisan positions central to his mayoral candidacy. One can expect that to continue or as one independent observer noted about the recent media blitz by Bhalla, "He's already running for his next position." Specific details of the newest evidence obtained by the Hoboken Police have been withheld to preserve the integrity of the investigation.